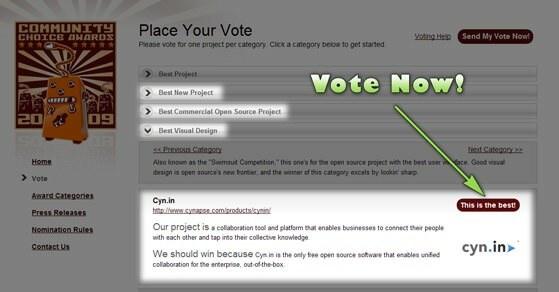 cyn.in a Finalist @ the Sourceforge Community Choice Awards ’09 – Vote for us to Win! Sourceforge has announced the Finalists for the Sourceforge Community Choice Awards 2009. We are thrilled that Cyn.in is a finalist for the Awards in three categories. Cyn.in is among the 85 Finalists chosen from 47,887 nominations for 4,875 distinct projects! We are sincerely honored by this recognition by our community and are thankful to all cyn.in fans for helping us get there. It is because of your continued support and passion for cyn.in, that we have made it to the finals of the Oscars of Open Source Awards. Please do encourage your friends and colleagues to vote for cyn.in. Tweet about it, use one of the social links below, call/mail/sms them to tell them about the Awards and how they can decide the winners of the Sourceforge Community Choice Awards before the 20th of July. 8000 votes have been cast for the Finalists already! So go ahead and make your voice heard. I’d like to carve out a little space to say a special THANK YOU to the cyn.in team, cyn.in community and all our fans who have helped us take cyn.in this far. There is no way around the simple basic truth: without YOU cyn.in would not exist. Your love, support and votes will surely help us win the Sourceforge Community Choice Award 2009!